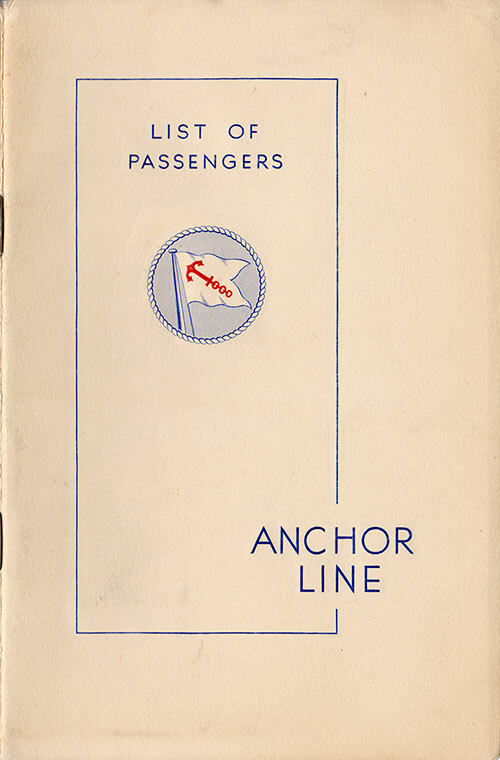 Cabin and Tourist Class Passenger List for the TSS Transylvania of the Anchor Line, Departing 11 September 1936 from Glasgow for New York via Dublin, Commanded by Captain David W. Bone. Mr. B. I. Salinger, Jr.
Mr. H. R. Lawton, Jr.
Mr. Edward P. Danson, Jr.
Meals.—Breakfast, 8 to 10 a.m.; Luncheon, 1 p.m.; Dinner, 7 p.m.
Breakfast, 8 to 10 a.m.; Lunch, First sitting, 12.30 p.m.; Second sitting, 1.30 p.m.
Dinner, First sitting, 6.15 p.m.; Second sitting, 7.30 p.m. Children's Meals — Breakfast, 9 a.m.; Dinner, noon; Tea, 5 to 6 p.m. Passengers may reserve seats at table for the voyage on application to the Chief Steward. Boat Muster and Fire Stations for Passengers.—A muster of Passengers will be held as soon as possible after leaving port, and in the interests of discipline all Passengers are requested to attend. Lifebelts must not be removed from staterooms, except in cases of extreme danger and for official Boat Muster. Divine Service will be held, weather permitting, on Sunday morning. Requisites are provided for the celebration of Mass. Episcopalian and Anglican clergy may, on applying to the Purser, have the use of plate and linen for the purpose of holding Communion. Additional Passage Money or Freight paid on board. —Passengers should obtain official receipt on the Company's form. Baggage.—Enquiries regarding baggage on board ship should be addressed to the Baggage-Master. To facilitate examination and identification of baggage on landing, all packages should have an official label affixed. These labels are supplied on board on application to Bedroom Steward. Wardrobe Trunks.—The attention of Passengers is called to the fact that the steamer has a Baggage Room where trunks may be stored during the voyage. It is not always possible to have large wardrobe trunks placed in an accessible position in passenger staterooms. Storage.—The Company will undertake to store steamer trunks belonging to Passengers at owner's risk until they are required for returning. Trunks should have owner's name printed on them, and they will not be re-shipped without instructions being sent to Baggage Master, Anchor Line, Yorkhill Quay, Glasgow. A description of the articles should be given, also name of steamer from which they were landed and date. No charge for storage is made if the owners return by the Company's vessels. If trunks are forwarded by rail this is done at owner's risk and expense. Kiosk.—Passengers can obtain confectionery, fruit, toys, souvenirs, novels, postage stamps, etc., in the Kiosk. Barber's Shop.—There is a fully equipped barber's shop on board for the convenience of Passengers. Clothes Pressing.—Application should be made to the Barber, from whom rates and other particulars can be obtained. Ladies' Hairdresser and Manicurist.—There is a well-appointed Ladies' Hairdresser and Manicurist's shop on board. For convenience appointments may be arranged. Changes in Accommodation.—The Purser alone is authorised to make changes in accommodation and may only do so on payment of any difference in fare which may be required according to Company's tariffs. Information.—If Passengers are in doubt on any point appertaining to their ocean voyage, or railroad journey, they are advised to consult the Purser. Landing Cards.—Passengers must obtain from the Purser a Landing Card. The hours at which these cards are obtainable will be posted on notice board. It should be noted that before leaving the vessel the holder must present this landing card to an Immigrant Inspector for endorsement. The Anchor Line News, containing the latest news by wireless and closing prices on the various Stock Exchanges, is published on board and distributed free to Passengers at breakfast time during the voyage. Library.—Library books may be obtained on application to the Librarian. The books are issued free of charge. Deck Chairs, Rugs and Cushions are available for hire and may be obtained on application to the Deck Steward. Port-Holes.—Passengers are requested not to open the ports. The Stewards will do this whenever practicable. Dogs and Cats.—Passengers are notified that dogs and Cats should be handed over to the livestock attendant on board and are not allowed in Staterooms, Public Rooms, or on Passenger Decks. Dogs and Cats cannot be landed in Great Britain unless a licence has been procured from the Board of Agriculture, London. Forms of licence and particulars of quarantine period can be obtained by direct application to the Department before the animal is taken on board. Dogs and Cats can only be carried by special arrangement being made with the Company prior to embarkation. Postage Stamps are on sale at Writing Rooms and Kiosks. A notice will be displayed stating the latest time for posting mail matter on board. British stamps must be used for correspondence posted on the High Seas. Rates :—Letters to United Kingdom and United States of America, 10. for the first ounce and ld. for each additional ounce. Postcards, 11d. each. Redirection of Mail.—Passengers who expect letters or parcels to be delivered to the ship after they have disembarked should leave their full names and addresses at the Bureau in order that their mail may be forwarded to them. Railway and Steamer Time Tables may be consulted on application to the Purser. Return Bookings.—The Purser and his staff will at all times be pleased to assist Passengers to arrange their return passages. Smoking.—Passengers are requested to be carefulrwhen smoking on deck to see that cigarettes and cigars are extinguished before being thrown away. Children are not allowed in the Smoking Room. Cabin Class.-5/- for the first visit and 2/6 per visit thereafter. In the case of sea-sickness or the consequences thereof, no charge will be made. In all cases medicines are provided by the Company free of charge. Nurse—A trained and qualified hospital Nurse is carried. Her services, under the direction of the Surgeon, are at the disposal of Passengers. Valuables.—Money or valuables should not be exposed in staterooms. For the convenience of Passengers the Company has provided a safe in the Purser's Office in which money, jewels, ornaments, documents, or other valuables may be deposited by Passengers. A receipt for any articles so deposited will be issued by the Purser, but the Company does not, having regard to the ticket conditions and to the provisions of Section 502 of the Merchant Shipping Act, 1894, and of Section 4281 of the revised Statutes of the United States, accept any responsibility for the safe custody of any such articles. Money Exchange.—Facilities are available on Steamers for Passengers to change sterling and American currency at favourable rates. Intimation will be made on the notice boards when transactions may be effected. In their own interests Passengers should obtain an Exchange Voucher on the Company's Printed Form for each transaction. Cheques.—Passengers are respectfully informed that the Purser is not authorised to accept private cheques. Complaints of incivility, carelessness or inattention on the part of any of the ship's staff should be immediately reported to the Purser or Chief Steward, and failing satisfaction to the Captain.